Read 2 times. Last read January 8, 2019 to February 3, 2019. So freaking good! I loved this book to bits and I am so glad that I went with all the hype and picked it up. A very well written fantasy novel with two strong female protagonists and a whole bunch of other awesome characters. A well balanced mix of action and heartbreak. I need the second book like yesterday! 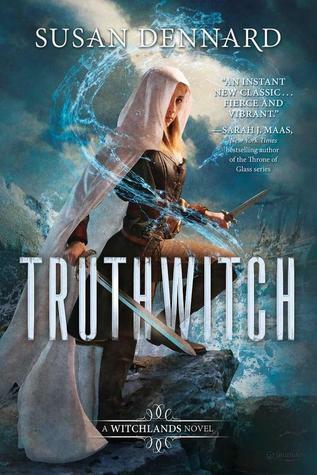 Sign into Goodreads to see if any of your friends have read Truthwitch. 5.54% "Yes! I'm reading it! Can't believe it!" 11.08% "I'm squeaking! Because I like everything so far!" 11.81% "Page 49 and foxes are mentioned! :D"
14.94% "I love the idea of Thread-families! And I hope for the love of God that those secondary characters that I already like will stay in the book for a long time because I have a knack for dotting on characters that get killed *hides*"
31.81% "There are so many characters that I like and rooting for! Gosh, I hope nobody dies D:"
42.89% "Back to reading this book and I'm sort of trying to savour it too as it's so good!" 47.23% "Some small things in this book remind me of Rook by Shannon Cameron. And I really liked that book!" 49.16% "Wow, Safi has to chill." 59.28% "SEA FOXES. SEA FOXES!!!!" 65.78% "I like Leopold. In fact, I like a lot of secondary characters in this book." 77.11% "I'm torn between finishing the book today or prolonging the pleasure of living in this world :)"
82.41% "I have so many theories! ^____^"
93.49% "No no no no no no"
100.0% "Done! IT WAS SO GOOD!" 7.0% "Started my re-read! In audio this time!" 29.0% "I almost got used to the accents 😬"
57.0% "Vivia is toooooo snappy here. Gosh"